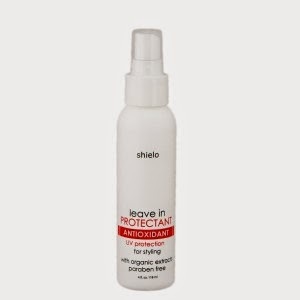 This is a daily Leave in Protectant, which protects hair from drying, conditions and softens hair. It is made with organic ingredients that are made in Oregon, US. It is made for all hair types. No parabens or harmful ingredients. 100% cruelty free. A must for hair that has been damaged by dryness, over-styling or being chemically treated. I have baby fine hair that is also very dry and dull. I rarely use heat on my hair, however on occasion I do like to use a flat iron or curler to create a hair style. Because my hair is already so dry, whenever I use a heat tool, it just kills my hair and makes it look as well as feel like straw. I have used store bought protectors before, but they never really did much for me. Las week I wanted to curl my hair using a hot curler so it was my perfect chance to try out the Shielo Leave In Hair Protector. I evenly spritzed it in my hair, and it kinda gave my hair a little bit of texture. I liked that especially since my hair is so baby fine, it tends to be a bit limp. I let it sit in my hair for 5 minutes, then began curling. I finished curling, and my curls felt quite soft, and not super dry feeling. I went about my day. The next day is when I really noticed how this hair protector worked. Normally the day after using heat on my hair, it would be beyond fried. This time, my hair was normal. It didn't look beat up and blah. I now use this a few times a week to help my hair, I feel like the longer I use it the more benefits I will see from it! Overall, I'm quite impressed and so is my hair!